Is it a coincidence that ESPN erased Curt Schilling’s epic ALCS Game 6 performance from their famous “Four Days in October” documentary when they needed to trim it for time purposes? 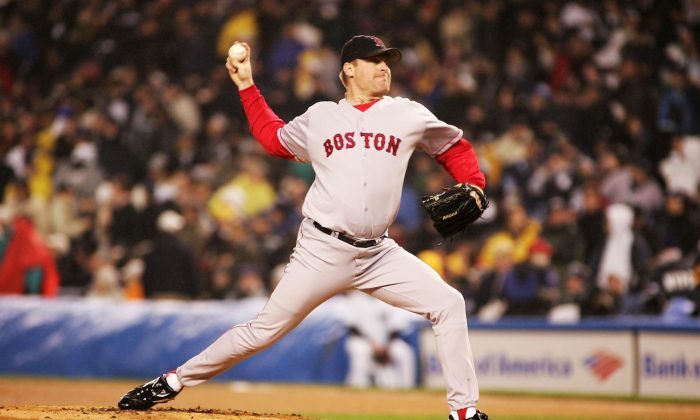 Sunday, ESPN aired a “30 for 30” documentary on Boston’s 2004 playoff comeback against the Yankees with Schilling’s “bloody sock game” cut from the broadcast. Schilling, who was a baseball analyst for the sports media giant, was fired by the network in April for comments he made on social media. The episode, which ran on ESPN2 following an Arizona-Oregon softball game, recounted the Boston Red Sox amazing comeback, which saw them become the first team ever to rebound from a 0–3 deficit to win four straight games and take the series. While Games 4 and 5 were both won in extra innings via walkoff hits from David Ortiz, Game 6 was about Schilling’s incredible performance at Yankee Stadium—despite suffering a torn tendon sheath in his right ankle that required an unusual medical procedure just days prior. A big-game performer throughout his career, Schilling still shut down the Yankees for seven innings, allowing just one run, while blood seeped through his sock, just above the shoe. The game also featured A-Rod’s infamous play where he knocked the ball out of Bronson Arroyo’s glove while running to first base. At first he got away with it in a play that scored Derek Jeter, but after a review, A-Rod was called out—much to the chagrin of Yankee fans in attendance who threw debris on the field, causing a delay. The part about Game 6 takes up roughly 17 minutes of the 65-minute documentary, according to a report in The Washington Post. Apparently ESPN wanted to trim the documentary into an hour-long episode with room for commercials. Schilling, for his part, clearly noticed the omission.